Modern apartment with air con & WiFi. Private roof terrace with great sea views. 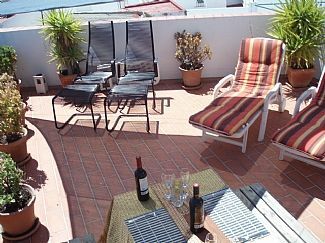 Apartment Tinto, combines the benefits of a high quality new building, yet situated in a charming part of the old town. Only 700 metres from the beach and 600 metres from the Plaza Espana. There are local shops in the small plaza to one side of the building. The apartment is equipped to a high standard with air conditioning in both bedrooms and satellite TV. The private roof terrace offer views over the beach and the coast of Africa is visible on a clear day. Modern contemporary room with mosaic tiling throughout. The vanity area has an inlaid sink, with mirror over, storage cabinet and a hair dryer. There is a bath with a shower over the bath and WC. A modern towel rail with spokes completes the look. Lovely Lounge two sofas, 3 and 2 seaters. There is a 37 inch TV with Sky Channels. Music facilities that lets you dock your IPhone plays, listen to CD not to mention the normal Spanish radio stations in Conil. The Dining area has a table and 4 chairs. Hob, oven, extractor, fridge/freezer, washing machine, toaster, blender, kettle, iron, microwave and ironing board. Campano 10 mins (9 holes). Montenmedio 17 mins (18 holes). Golf Sancti Petri 20 mins (36 holes). Benalup 30 mins (18 holes). Vista Hermosa 30 mins (9 holes). Sherry Jerez 45 mins (18 holes). La Duquesa 1 hourour 7 mins (18 holes). Un apartamento coqueto con una terraza maravillosa, el único inconveniente es que la terraza no se encuentra en el apartamento y hay que subir un piso. Muy bien situado y con fácil aparcamiento en la zona, limpio y cómodo. La terraza genial! Anfitriones super agradables, para repetir. 700 meters only from the fantastic sandy beach that stretches from Conil all the way to Cape Trafalgar. Excellent beach for surfing and kite surfing. Airports approx times: Jerez 45 mins. Gibraltar 90 mins. Seville 2 hours. Jerez 50mins, Seville 2hrs Malaga 2½ hours. Faro (Portugal) 4 hours. Ryan Air and Berlin Air to Jerez, Seville. BA from Heathrow and Gatwick to Seville, Gibraltar, Malaga and Faro. Monarch from Luton and Gatwick to Gibraltar as well as Manchester to Jerez. EasyJet - Gatwick, Luton, Stansted, Bristol, East Midlands to Malaga and Faro. Newcastle and Liverpool to Malaga and Seville. Iberia - London to Seville, Jerez and Faro. Alcala 35 mins. Arcos 1 hour. Benalup 30 mins. Chiclana 20 mins. Cadiz 30 mins. Gibraltar 1.5 hrs. Medina 20 mins. Seville 2 hrs. Vejer 14 mins. Market days: Tuesday Algeciras, Chiclana, El Puerto de Santa Maria. Wednesday Rota. Thursday San Fernando, Vejer. Friday Conil. Sunday Cadiz and Seville/Alameda de Hercules. Jerez 11-2 Plaza del Mercado and Calle Muro Flea Market). Conil is a small fishing town that sits aside one of Europe's most beautiful and still uncrowded beaches. A great area for active sports, and well known by bird watchers. The Cadiz Sierras are only an 1hr 30mins drive away. Ferries cross daily from nearby Tarifa to Tangier.